There was a major breakthrough in 1973 when Clarks Mens Shoes agreed to support the organisation of the Men's National League. The sum of £2,500 was agreed and this was used to pay for various inovations. A part-time administrator was appointed, responsible for arranging referees and paying their travelling expenses and fees. Commisioners were appointed to all games to ensure the smooth operation of matches and to report on the general conduct of games. Newspapers, however were reluctant to refer to the Clarks Mens Shoes National League on the grounds that it was free advertising. 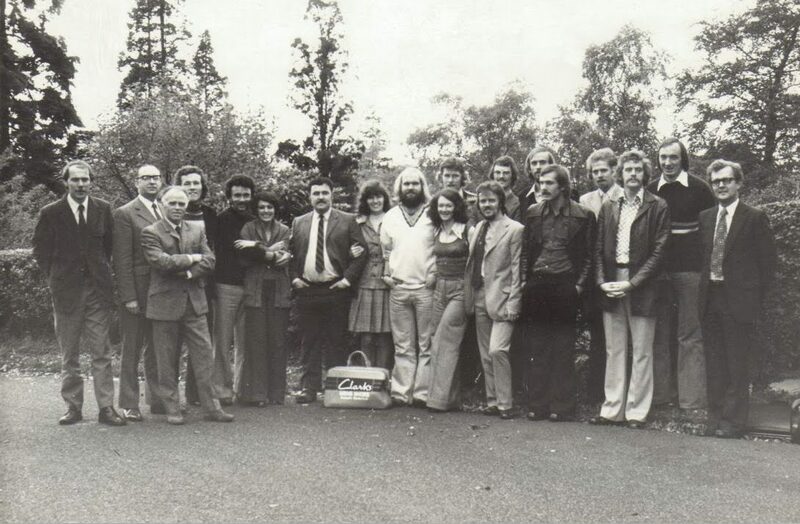 meeting of all National League Clubs was held in the Dunblane Hydro Hotel at which they agreed to the objective of promoting the company through a well organised sports competition. Clubs agreed to provide results to the league administrator who would deliver the league tables and statistics to the media in regular press releases. As sports sponsorship became more prevalent, the media began to include sponsors names in these articles refering to the events. In 1976 the ABAS agreed to host a Pre-Olympic Tournament for European teams to Qualify for the games to be played later that year in Montreal. It was a major undertaking for a small country with potential benefits in terms of television coverage and related publicity. Volunteers from all parts of the country were recruited for the event which was held at Meadowbank Sports Centre. It was a great success and a memorable final was played between the eventual qualifiers Yugoslavia and Italy. The tournament was supported by the Scottish Sports Council with a special grant of £4,285 and in addition the ABAS attracted sponsorships to the value of £4,500. Negotiations with the Bank of Scotland resulted in a support for the Junior National League and Cups. In 1947 there were only five Universities in Scotland. These were located in the four cities of Aberdeen, Dundee, Edinburgh & Glasgow. The fifth was, of course, St Andrews which was the first University in Scotland founded in the year 1413. University sport was basically rugby in winter, cricket and athletics in summer. Recreation departments also encouraged the traditional activities of rowing, fencing and tennis. Regular participation for the University Team in these activities would merit the individual award of a colour. The Scotsman reported on 9 November 1949 that St Andrews University had awarded "half blues" to students J Crieghton and R Olsen. In those "Amateur" days the Captain of each sport wielded enormous influence. He would recruit players, organise training and arrange fixtures with other Universities. Recreation departments acted as facilitators responding to interest within the student population. Indoor facilities were extremely limited. None of the five Universities could boast a hall capable of housing a full sized basketball court. Edinburgh University had a gymnasium with pillars at intervals down the centre of the court to support the ceiling. The University used the Pleasance Trust Gymnasium for participation in the East of Scotland League. In the aftermath of the Second World War foreign students were a rare breed. However the occasional American student would register and help to stimulate a basketball programme. In addition to entering a team in a local league some arranged to play against the other Scottish Universities. The growth in student populations and an increase in interest in Sport & Recreation prompted Universities to appoint more Physical Education staff and develop indoor facilities. Glasgow University was first to build a Sports Hall with a full size basketball court. It incorporated a small gallery which could accommodate about 50 spectators. This probably amused the American students, more used to a College Sports facility designed to accommodate several hundred spectators. St Andrews University was next to build a Sports Complex. Once again a full size court was incorporated but this time with limited spectator facilities. Three new Scottish Universities were formed in the 1960's. Strathclyde (formerly The Royal College of Science and Technology), Heriot Watt and Stirling, the latter on a new campus on the Airthrie Estate to the North of town. All three built significant Sports Halls. Aberdeen and Edinburgh Universities followed the pattern and built new sports facilities incorporating a basketball court. An annual Scottish Universities Tournament was established and Universities took turns hosting the event. As the number of Universities in Great Britain expanded it triggered the establishment in 1972 of the Scottish Universities Sports Federation (SUSF) and the British Universities Sports Federation (BUSF). The SUSF was responsible for encouraging the development of Inter University activity in Scotland. The BUSF was responsible for England, Wales & Northern Ireland. 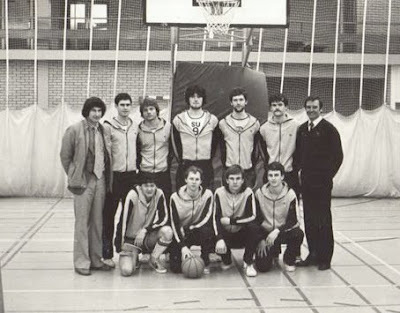 Basketball was represented in both BUSF & SUSF organisations and Scotland entered the first BUSF Basketball Championships which were played at Birmingham University in 1973. The first recorded world wide basketball game played by Women was in 1892. It involved the University of California and Miss Head's School. The sport spread like wildfire among American Colleges and by 1895 Inter-Collegiate games were being played. Protocol in those days demanded that women playing sports should wear outfits that were considered feminine. Long skirts and voluminous blouses were obligatory. This restricted the ability to run and pass or dribble the ball. Indeed decorum required many of these early games to be played behing closed doors and spectators were barred. Various versions of women's basketball rules with similarities to netball were in operation in the United States until quite recently. Perhaps the biggest impact on women's basketball was the legislation introduced by US President Richard Nixon in 1972 when Title IX of the Civil Rights Act was passed into law. It required, amongst a host of other civil rights, that educational institutions would treat male & female sports programmes on an equal financial basis. High School and College basketball programmes for girls then began to flourish. When FIBA was established in 1932 it assumed responsibility for men's and women's basketball throughout the world. It established a Commission charged with the responsibility of developing Women's Basketball. The first European Women's Championship was organised in 1938. The Italian Federation hosted the event which was played in Rome. Only five countries took part. It was 1950 before the next Championship took place, this time in Budapest, Hungary when twelve teams participated. FIBA Europe now organises European Cups and a bi-ennial European Championship for Women. On the world level FIBA organises the Olympic basketball tournament and the World Championships for Women on a four year cycle. At the formation of the ABAS in 1947 a Women's Committee had been established. The committee was responsible for the promotion and encouragement of basketball for ladies. It operated as an autonomous group, electing its own Secretary and Chairman. Wives & girl friends of the Polonia Mens Club started a ladies section and arranged "friendly" matches with several local men's teams. A Scottish Women's Cup was presented by Maryhill Club President James Muirhead in 1948. The leading clubs in those early days were King's Park and Maryhill in the West of Scotland and Polonia, Latter Day Saints and Shooting Stars in the East. Members of the Polonia Club frustrated by a lack of competition broke away to establish a new club which they named Auld Reekie. Competing with a formidable netball structure in the West of Scotland, women's basketball declined in that part of the country. Auld Reekie became the dominant club in those early years, winning the Scottish Women's Cup seven years in a row from 1950. Younger members of Auld Reekie, following the pattern established by their mentors, resolved to form a new club. The All Blacks were born. Meanwhile established men's clubs formed Women's sections as Boroughmuir, Dalkeith and Paisley entered a highly competitive environment. The Women's National League was started in 196?. In 1956 the Scottish Women's Team had entered the European Championships which were held in Prague. It was a huge challenge requiring the team members to raise all the funds for the cost of travel and equipment. Sixteen countries entered and although the Scots finished last they had encouraging results against Denmark, Germany and Switzerland. ﻿In the mid 1950's a small United States Air Force Unit took occupation of the RAF station at Kirknewton, Midlothian, some five miles West of the Edinburgh City boundary. Lacking a proper basketball court they converted a hangar to a gymnasium and started playing matches with teams from other US Military bases in the UK and Europe. The team was christened the Kirknewton Comets and Edinburgh enthusiasts found ways of travelling to the remote location to watch matches with visiting teams. These matches were of a much higher standard than local Scottish teams could achieve, but the cold hangar, even with the use of huge hot air blowers, was impractical. The Comets eventually were persuaded to play home games at the Pleasance Gymnasium. These games became very popular with the local basketball community. Sitting on benches behind the baskets and around the court sidelines in addition to hanging from the wallbars, more than 200 spectators would squeeze into the hall. A second string Kirknewton team named the Knights, entered the East of Scotland League and played their home games at Redford Barracks. This arrangement continued until a new facility was opened at Kirknewton in 1959. It was the first full sized basketball court in Scotland . With provision for about 400 spectators on tiered "Bleacher" seating, it was a revelation. It featured a sprung wood floor, transparent backboards, a high ceiling and excellent lighting. As such it was the perfect venue for the inaugural four country tournament organised to select a Great Britain team in 1960. The small number of USAF personnel at Kirknewton meant there were hardly enough players to support an intra-mural league. Heriot's F.P. and the fledgling Boroughmuir Basketball Club were invited to join the league and play games on a weekly basis. The Boroughmuir Boys, mostly still at school, had to cycle out to Kirknewton for each game. The more mature Heriot's team would squeeze in to a couple of cars. Sadly from an East of Scotland point of view the USAF closed down their Kirknewton operation in the late 60's. 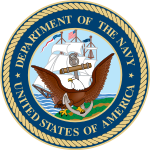 The United States Navy had recently opened the controversial Nuclear Submarine Base at the Holy Loch and established an on-shore base for maintenance staff. Naturally a gymnasium with full size basketball court would feature in the recreational facilities. Enthusiastic officers on the base encouraged local clubs to travel to Dunoon for games with the US Navy Team. A similar situation developed when the USAF opened a small communications unit at RAF Edzell in the county of Angus. Once again a full size basketball court with provision for spectators had been built and local clubs were invited to play against the base team. Following discussions between the ABAS and the authorities at Dunoon and Edzell it was agreed to establish the Scot/Am League with Boroughmuir FP, Pierce Institute (Glasgow) and St Michael's FP (Dundee) basketball clubs joining the two US military bases. By the time the US Navy closed the base at Holy Loch and the USAF vacated Edzell the Scottish National League was a thriving entity. Paisley basketball club started a new trend - inviting the first American player to come to Scotland and bolster their team. Chuck Chambliss made an immediate impression and Paisley went on to participate in the Scottish Cup Final. Murray Metals followed suit and brought in Kurt McKeown. Soon other Scottish clubs copied their lead with Boroughmuir, Falkirk and Perth recruiting American players. The International Federation, concerned about the growing number of American players being signed up by the leading European clubs, introduced a regulation limiting to two, the number of foreign players allowed in a team. The ABAS adopted this policy. Murray International (MIM) signed Americans Lewis Young and Charlie Williamson while Falkirk recruited the charismatic Bobby Kinser later to be joined by Terry Manghum. A rivalry was born. In 1950 an American Youth Leader recognised the potential of a scaled down version of basketball for primary school aged children. Jay Archer called it "Biddy Basketball". The baskets were lowered to a height of eight feet six inches and a smaller size ball made shooting and dribbling easier. It proved to be an enormous success and is still called Biddy Ball in the United States. The International Basketball Federation copied the best components of Biddy Ball and promoted a version which they called Mini-Basketball. By 1970 FIBA had produced a rule book and guide lines for teachers/leaders. The emphasis was on participation and fun. Designed to encourage mixed boys and girls teams and involving running, jumping, catching and throwing, it was seen as an ideal activity for introducing young children to sport. In Scotland primary schools seemed an obvious starting point. While a programme of games hall construction had started in secondary schools there were very few primary schools that could boast a gymnasium. Primary School Physical Education classes were typically conducted in the school assembly hall. There were no mini basketball goals. 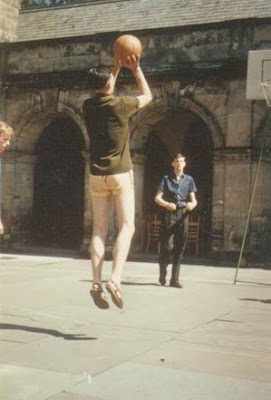 A modified version of mini-basketball was devised. One pupil would stand on a bench and try to catch "shots" from team-mates. Each successful catch was deemed a goal. Mini-basketball was introduced to the curriculum at several primary school teacher training colleges. Many graduates went on to include mini-basketball in their PE classes. Directors of Physical Education were approached with a view to purchasing mini-baskets which could be used indoors or in playgrounds. As new primary schools were built the gymnasium usually incorporated a mini-basketball court. Many primary schools installed baskets on a school wall in the playground. Local authorities were invited to organise mini-basketball "Festivals". These were designed to give the participating children an opportunity to play in a controlled competitive environment with other local schools. The emphasis was always on participation and enjoyment. The best team from each local festival was invited to a "National Festival" held at Meadowbank Sports Centre. Schools from all parts of Scotland took part. The festivals proved to be an outstanding success with more than 300 children involved annually. A feature of the rules was that mixed teams of boys and girls could participate. Indeed at least two girls had to be on court at any time. It was rewarding to see how well the players and their teachers responded to the satisfaction of winning and the acceptance of defeat. A true measure of preparation for life in the "real" world. Basketball started in the YMCA and was quickly adopted by American Colleges as a "Major" sport. The natural progression was to introduce the game to High Schools. In the early twentieth century American High Schools were typically small and community based. Basketball was an ideal activity for inter-school competition. State Championships were held but efforts to introduce a nationwide US High School Championship were resisted. Various educational reports led to a policy of the 'Consolidation of High Schools' on the basis that larger schools serving a larger catchment area would lead to a more economic use of educational funds and a broader curriculum. The trend has continued. Typical modern day US urban Community High Schools have a population exceeding 2,000 pupils. Along with financial incentives for new larger school buildings came improved facilities for sport and physical education. Spectator accommodation was invariably part and parcel of sports facilities. Sports Halls in many current High Schools seat several hundred spectators. The situation in Scotland was quite different. Physical Education in the school was mainly gymnastics and exercises. Games afternoons prepared students for Saturday morning outdoor team sports or athletics. There was little or no interest in basketball by schools in the 1940 decade. Indeed few even had baskets installed in the gymnasium. Resistance to the introduction of "NEW" sports was widespread in Physical Education Departments. Many saw them as a threat to the traditional winter sports of rugby (predominant in private and grant aided schools) and soccer. Notable exceptions to that rule were George Heriot's and The Royal High School which had baskets installed in their gymnasia and flourishing Former Pupil's Teams playing in the local league. Young male PE Graduates from Jordanhill College in the 1950's had received an introduction to basketball in their diploma course. Some believed basketball to be an exciting new sport and saw an opportunity to make an impact in the schools to which they were appointed. Schools installed baskets in gymnasia and informal fixtures with like minded PE Departments in the neighbourhood were arranged. As more young PE graduates left Jordanhill College, inter-school competition mushroomed and organised leagues were established in local education authority catchment areas. Progress was more difficult for schoolgirl basketball. A few male PE Teachers established a schoolgirl programme but development was sporadic. Dunfermline College of Physical Education (DCPE) was responsible for the training of all female PE teachers. The College focus was on netball, a modified version of basketball which had been adopted by female sports enthusiasts in London in 1895. Netball quickly spread throughout the British Empire and is now played exclusively in the British Commonwealth. Basketball received little attention in the DCPE curriculum until the mid 1970's when lecturers with a basketball background were appointed. The ABAS was keen to encourage the development of Schools Basketball and in 1966 offered a cup for a National Schools Competition. A group of enthusiastic teachers called a meeting to form the Scottish Schools Basketball Association (SSBA) with a view to organising the inaugural Scottish Schools Cup, a competition for under 19 boys. The event proved to be very successful and within a few years there were National Cup Competions for Open, Under 16, under 15 and under 14 boys and girls. A thriving schools programme was developing in England and the first International between Scotland & England was played in the Perth City Town Hall. Internationals with England, Wales & Ireland for under 19 and under 16 boys and girls were established and became annual fixtures. Regional Tournaments were organised on a yearly basis and were used to select National Teams. The growth of Schools Basketball was so great that it was proving well nigh impossible for working teachers to cope with the administrative load. The ABAS had recently appointed a full time officer and the SSBA agreed to amalgamate with the parent association while maintaining their own autonomous committee. Basketball's inventor, James Naismith, used a size five soccer ball for the early games. In those days soccer balls were composed of an outer case made from leather panels stitched together and an inner inflated rubber bladder. Access to the bladder was achieved through an aperture which was closed with a lace. Naismith soon realised that a larger ball than the standard soccer ball would be required. He approached the Spalding Company in the late 1890s and they agreed to make a larger ball which approximated to a size seven soccer ball. Due to the rapid development of the new sport several other manufacturers began producing similar sized balls in the early 1900s. Because of stretching of the leather panels and in particular, the lacing on the cover, early basketballs were not perfectly symetrical. This made dribbling the ball difficult and often affected the trajectory of a pass or shot. It was not until 1942 that the laminated basketball with a "needle" valve was invented in the United States. It was now possible to mass produce balls which were perfectly symetrical and hardly ever lost their shape. Leather was still the favoured outer surface but rubber and other synthetic materials were more durable, particularly on outdoor surfaces. The old leather panel balls were still used in Scotland until the mid 1950's. About this time laminated balls would start to penetrate the UK market and were highly prized by Scottish Clubs. Footwear for the early pioneers in the USA was a standard plimsoll or gym shoe. It was not until 1921 that the Converse shoe company would produce a special basketball shoe designed by "Chuck" Taylor. It featured a canvas top and a specially designed rubber sole to improve traction on the hardwood floors. The company later introduced a 'high top' version designed to support the player's ankle. The Original "Chuck" Taylor shoe dominated the basketball world market until the 1960s when shoes with leather uppers were introduced. Dunlop had entered the sports shoe market in the 1920's and added a basketball product based on the design of the Converse High Top to their catalogue in the 1940's. The Dunlop shoe was readily available to Scottish basketball enthusiasts but the ambition of the top players was to own a pair of "Chuck" Taylors. It was not until the opening of the Kirknewton USAF unit in the 1960s that the American product became widely available. Puma and the small Nike company did not enter the basketball shoe market until the 1970's. On it's introduction in Nike's "Air" Jordan shoe supplanted the Converse shoe as the most popular basketball footwear and helped establish the company as a world leader in sports equipment. In order to identify individual participants as points were scored and fouls committed, each player was required to wear a top with a number on the front and back of the garment. Athletic vests were commonly used in the early years. Each team would choose a colour and doting mothers, wives or girl friends would sew on the numerals. Colour clashes were quite common making the referees' task more difficult. As the sport became more popular a few clothing companies offered to supply custom made playing uniforms with team names and numbers attached. Free standing basketball goals were commonplace. The backboard was supported on a tubular metal frame with a heavy counterweight located at ground level to the rear. Due to the weight of the backboard and ring, the base of the metal frame was inside the court. Players had to be careful not to run into the support whether in attack or defence. In small gymnasia the walls would be considered as the court boundary and backboards rarely projected into the court more than a few inches. The Glasgow based sports equipment manufacturer, Hampden Sports, enjoyed a period of sustained business as they supplied basketball goals to Scottish schools and sports centres. They even designed an aluminium basketball ring which incorporated metal loops to attach the nets. The innovative design failed as the softer aluminium proved unable to cope with the constant contact with basketballs striking the front of the ring which eventually started to bend. At the birth of the Amateur Basketball Association of Scotland there was not a single full sized basketball court in the country. The standard for a full size court was 26 metres (85 feet) by 14 metres (46 feet). Clubs played anywhere they could find a large enough space. School gymnasia were typically 60 ft x 30 ft but only a few had basketball goals installed. Wall bars and beams were additional hazards. Free standing goals were stored in Territorial Army Drill Halls and other similar establishments. Military vehicles or furniture often had to be moved to create enough space for the court. Some halls had stages at one end and a special "Goal" had to be erected on the stage. It is quite remarkable that basketball made such good progress in the early years given the serious limitation of suitable facilities. In Edinburgh the enterprising local league played matches in the Palais De Dance. The floor was a magnificent sprung maple wood, but was very slippy. Players adjusted to the hazard but the venue was withdrawn when a stray basketball shattered the spinning ball of mirrors suspended from the ceiling. The finest court in Scotland was at the Pleasance Trust in Edinburgh. It also had a sprung maple wood floor. Although the court was slightly narrower and shorter than full size, baskets were suspended from the ceiling allowing players the luxury of running under the basket without fear of crashing into a wall, wall bars, stages or supporting metal. It was no co-incidence that the leading team in Scotland in those early days was the Pleasance Boys Club. As basketball became more popular The Pleasance became the favoured venue of several Edinburgh clubs and the hall was in use for three sessions every weekday evening and at weekends. Unfortunately the ceiling was quite low and at one end had gymnastic beams suspended from the roof which limited longer range shots. Eventually the owners removed the wall bars from each side of the court, the gymnastic beams and replaced the hanging lights with a recessed variety. An interesting facility was the old gymnasium at Edinburgh University. It had pillars running down the centre of the court at 20 foot intervals to support the ceiling. This was similar to some early facilities in America and the use of the pillars to brush off opponents became known as a "Post Play". Enterprising coaches saw the potential of the pillars and replaced the pillar with a stationary player who was "Posting up". As new schools and colleges were built, gymnasia gradually became larger until in the late 60's the Scottish Education Department adopted a policy of building Games Halls. These were designed to accommodate a full size basketball and volleyball court in addition to several badminton courts. Games Halls became the dominant location for basketball activity, but unfortunately few had facilities for spectators. The 1970 Commonwealth Games was another watershed for the provision of sports facilities in Scotland. The Meadowbank Sports Centre incorporated three areas which accommodated a full size basketball court and two had significant spectator provision. Each hall had an electronic scoreboard and timekeeping device which added to the spectating experience. Recreation Departments in local authorities around the country created programmes for the construction of multi-sports centres. Many of these were "Prestige" buildings and were often too expensive for local basketball clubs to hire. An Edinburgh entrepreneur was convinced by local basketball enthusiasts that the game had great spectator potential. He had converted a local dance hall in to a roller skating rink and was looking for a larger facility to marry a roller rink with a basketball venue. He found the answer in the disused Falkirk Ice Rink. A superb timber floor was laid which was an excellent facility for roller skating. With the installation of top quality basketball goals, it was a natural venue for major basketball events having seating for 3,000 spectators. A local Falkirk basketball club had been started and quickly established itself in the Scottish Basketball hierarchy. Unfortunately the hall had been designed for Ice Hockey and was well nigh impossible to heat. Shortly after housing the 19 Scottish Cup Final between Murray International and Falkirk's own P&D Windows before a full house of spectators, the roof was condemned and the facility closed. Meanwhile Murray International had convinced the Livingston Development Committee that they should have a Sports Centre with spectator provision. The project was completed and MIM played European Cup and British League matches at their new home. This was the first and only facility in Scotland, built with the primary intention of holding basketball matches. Unfortuately David Murray lost interest in basketball after he purchased Glasgow Rangers FC and the building was later demolished. Basketball is essentially a very simple game. The fundamental skills of passing, dribbling and shooting are relatively straightforward. In the early days of Scottish basketball, coaching was mainly about teaching these skills along with some basic footwork related to pivoting and starting and stopping a dribble. The concept of a Game Coach was alien to traditional British Sports and some actually forbade the practice. Game Coaching is an integral part of American Sport and basketball was no exception to that rule. The need to organise substitutions and adjust tactics resulted in an enhanced role for the experienced Player/Captain. When not playing, the Captain would coach from the substitutes bench. Gradually these leaders assumed the role of non-playing coach. Coaches endeavouring to enhance their knowledge of tactics and strategies would search local libraries in vain for helpful literature. Teams employed zone defences, no doubt copied from soccer experiences. Players were responsible for defending an area (zone) and were given specific roles. Players near the basket they were defending would be responsible for rebounding and passing to front runners who would endeavour to score an early basket at the other end of the court. Zones would retreat quickly after a score or change of possession making it difficult for the opponents to shoot from a short distance. Long range shooting was difficult due to various factors, including the heavy, often misshapen leather ball, the quality of the goals and overhead obstructions. As playing skills and equipment improved coaches began experimenting with alternative defences. Man to man and pressure defences were introduced and the coaches' role was further enhanced. The Scottish Council of Physical Recreation (SCPR) established summer schools in the 1950's for various sports in St Andrews, using the vacant student residential halls for accommodation. Basketball was one of the sports offered. Instructors were drawn from Central Council of Physical Recreation staff. Joe Jagger (father of Rolling Stone Mick) was the lead basketball coach. When the SCPR withdrew from the organisation of the Summer Schools at the end of the decade the ABAS assumed responsibility, organising coaching staff and advertising the courses through clubs and local authority Education Departments. Facilities for the basketball summer courses were rather primitive. Practical sessions were conducted in the inner quadrangle of the listed building of Madras College on South Street. The area was unevenly paved and the baskets were the free standing variety with a very small overhang. If it rained the participants retreated to a classroom for a theory session or sheltered under the cloisters until it stopped raining. On good days course members would carry the basketball goals through the streets of the town to the beach and give an exhibition on the wet sands. As the courses became more popular and incorporated officiating and player improvement, more facilities were required. The local youth club had built a small gymnasium which incorporated basketball goals and the local Territorial Army Drill Hall became available. The baskets were moved from Madras College to the TA hall which was a vast improvement. A new Madras College building to the South of the town was built, incorporating a full size games hall. Shortly after St Andrews University open a superb new facilty to the west. Through contacts established with various Colleges in North America the ABAS was able to invite a series of High School and College coaches to supplement the coaching staff. The visiting coaches contributed greatly to the status of the courses. Informal evening discussions with Scottish coaches proved to be extremely valuable. Many Local Authorities gave financial assistance to teachers to attend the summer courses to qualify as coaches or referees. This was considered to be part of their in-service training. Many would return as instructors and leaders of coaching and player improvement courses. Eventually players and coaches of the Scottish Schools under 15 and under 18 teams would be supported as they prepared for their international programmes. At the height of the summer schools popularity, there were three weeks of activity with up to twenty trainee coaches, ten trainee officials and sixty schoolchildren each week. In the formative years of Scottish Basketball the SCPR assumed responsibility for training and educating referees (officials). Courses were held at local venues and the SCPR organised weekend residential courses at the Boys Brigade centre at Carronvale House, Larbert. These courses graduated to week long courses at an annual summer school in St Andrews. Guest lecturers were recruited from CCPR staff in England who had made a study of the new sport. An early officiating pioneer was William (Bill) Bird, an American basketball enthusiast based in the West of Scotland who was emplyed by a US company to sell locomatives. Alec Leslie, who had the distinction of being in charge of the Princes Street Gardens demonstration by the 1948 US Olympic Team, led the way in the East. They were followed by Thomas (Tucker) Johnston and Ronald (Ron) Hyslop who became dedicated basketball officials. In 1959 they achieved the distinction of becoming Scotland's first internationally qualified referees The duo were instrumental in founding the Scottish Basketball Officials Panel (SBOP) and conducted innumerable courses for officiating candidates, throughout the length & breadth of Scotland. The International Basketball Federation (FIBA) had been founded in Geneva, Switzerland in 1932. In addition to organising all international competition, the International Olympic Committee (IOC) recognised FIBA as the responsible body for the first Olympic Basketball Tournament which was in the 1936 Games in Berlin. At its inaugural meeting FIBA would also assume the right to determine the Rules of Basketball and standards of equipment and facilities for all international play. R William Jones had been the catalyst for the formation of FIBA and the inclusion of basketball in the Olympic Games. At the first meeting, aged twenty-six, he was appointed General Secretary of FIBA. He had attended Springfield College in Massachussets in 1928 where his interest in basketball and the Rules of the Game were developed. Various versions of the rules of play had developed in the United States. Jones was determined that there should be a universal standard and in 1934 produced the first International Basketball Rule Book in English. The fledgling ABAS in 1947 relied on a few copies of rule books which had been published abroad. Rule interpretations were varied and inconsistent. Messrs Johnston and Hyslop attended FIBA Rules Seminars where General Secretary Jones would give definitive pronouncements on the interpretation of the rules of play. They would return to Scotland and relay the information to other Scottish officials thereby creating a more uniform refereeing standard. The annual residential Summer Schools at St Andrews incorporated an officials' course organised by the SBOP. Trainee officials were given practical experience working the daily matches played by youngsters participating in a concurrent player improvement course. In the 1960's the ABAS struck a deal with the English Basketball Association for the joint publication of the latest version of the International Rules. Enough copies of the Scottish version were printed to enable the distribution of a rule book to every registered player in Scotland. This process was repeated as FIBA modified the rules every four years. In order to participate in European competitions the ABAS had an obligation to have internationally qualified officials accompany their teams. Scottish candidates were groomed by Tucker Johnston and Ron Hyslop and encouraged to attend the annual clinic organised by FIBA. Robert (Rab) Petrie would gain his "FIBA" licencee in 1965 and Ken Johnston followed the same route in 1966. The Commonwealth Games of 1970 had provided Edinburgh with an impressive new sports facility which incorporated three full size basketball courts. It also boasted rooms suitable for theoretical sessions. With four FIBA candidates in the pipeline the ABAS volunteered to host the 1971 officials clinic. Officials and candidates from all over europe were housed in the new Edinburgh University residences and bussed to Meadowbank for the daily activity. An innovation for the clinic was a competitive tournament organised by the ABAS each evening. These games were used by the FIBA examiners to assess the practical ability of the candidates. All four Scottish candidates, Alan Crow, John Glen, Danny Kaye and Roddy Willson would pass the test. In all twenty Scottish officials have attained the FIBA quailification but perhaps the most interesting were Muriel Gilligan and Maureen McKenna. Muriel was the first woman FIBA official in europe when she qualified in 1979. Maureen would follow in her predecessors footsteps when she passed in 1990. Early informal local competition was the forerunner of the Scottish Cup which was inaugurated in 1947. Kemsley Newspapers presented the fine trophy which is still the ultimate prize in Scottish Basketball. A similar trophy for Women's basketball was donated in 1948 by James Muirhead who was the founder of the Glasgow based Maryhill Club. Local Leagues flourished in the main areas of population and an annual East V West match was established. On the 3 June 1947 The Scotsman reported that a basketball competition was to be played in Princes Street Gardens. This was a regular East of Scotland League programme which was played during the summer of that year. Basketball stands were stored in the Ross Band Stand and brought out for evening matches. This early success prompted the ABAS to organise the Scottish Cup Final in Princes Street Gardens. The Pleasance Boys Club played Aberdeen University at this venue and the local club were victorious. During the 1960's & 1970's decades, leading clubs in the local Associations sought more regular top level competition. Invitation tournaments were established and for the most commited clubs the highlights of each year were the Christmas/New Year Tournament hosted by the US Navy at Dunoon and the Spring Tournament hosted by the US Air Force at RAF Edzell. The demand for more regular top level competition was satisfied by the establishment of the "Scot/Am League". The founding participants were Hornets, Boroughmuir FP, Pierce Institute (Glasgow), St Michael's FP (Dundee) and the US teams from Dunoon and Edzell. Gradually more teams joined the Scot/Am League. When the US Military bases at Dunoon and Edzell closed the Scottish National League took centre stage. To deal with the increase in activity the Association appointed a National League Administrator on a part time basis. The number of participating teams increased along with income from entry and registration fees. The Adminstrator's post was made full time. At the height of popularity the National Leagues had four men's divisions and two women's divisions. These were soon complemented by Junior (under 19) and Youth (under 17) leagues for boys and girls. Meanwhile the Scottish Cups had grown from strength to strength. With more and more teams entering the National Competitions the Scottish Basketball Association catered for Senior, Junior and Youth Cups for boys and girls. They also introduced the Chairman's Cups for teams eliminated in the first rounds of the Senior Competitions. The Scottish Cup Finals were organised on a Championship weekend bringing all the finalists together for the season finale. This was made possible in the 1970's because of the opening of the new indoor facilities built for the 1970 Commonwealth Games at Meadowbank in Edinburgh. Represented Scotland from 1955 until 1965. Appointed National Coach/Administrator by the Executive Committee of the Amateur Basketball Association in July 1965. Continued to Serve the Scottish Basketball Association as National Coach and Technical Director until 1995. Member of Great Britain Basketball Team 1960. Great Britain Team Manager 1964. Great Britain Basketball Team Coach 1968 and 1972.